While singleness is often widely misunderstood by many in the church today and often viewed in negative terms, the Bible speaks about it very differently. This book sets forth a positive vision of singleness by responding to 7 common misconceptions, such as the notion that singleness is too hard, requires a special spiritual gift, is a hindrance to ministry, or is a waste of sexuality. 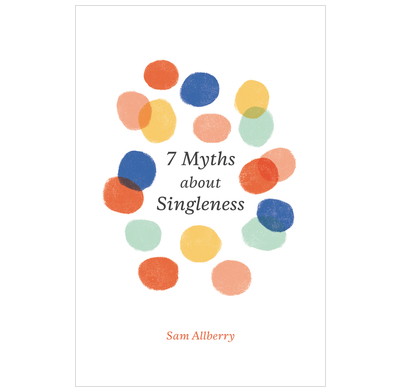 Addressed to the church as a whole and written by single pastor, Sam Allberry, 7 Myths about Singleness will help readers better understand, support, and empower the singles around them to contribute to the flourishing of the church as a whole. Sam Allberry flushes out the several hidden, barely conscious assumptions about singleness and celibacy that control our attitudes toward single living. Once he makes these assumptions visible, he uses the Bible to dismantle them and show us a better way. It would be a great mistake, however, if we were to think this is a book only for singles. If Sam is right—and he is—the entire church must understand the biblical teaching on this subject. The local congregation must be not merely a loose network of families but a close-knit family itself, consisting of both married couples and singles, all living together as brothers and sisters. This volume will show us how to do that. 7 Myths about Singleness offers a refreshing, biblical perspective on an oft-neglected topic. Allberry writes to remove the stigma from the idea of singleness and to help Christians think biblically about the callings of singles within the body of Christ. This timely resource will benefit the church for years to come. 7 Myths about Singleness makes the glory of Jesus, a single man, more obvious in ways helpful to us all. Sam Allberry opens our eyes to how we can better understand ourselves and one another, how we can better steward our married or single lives, and especially how we can stop chasing the myths that break our hearts. He does this by showing us more of Jesus where it can be hard to find him—in the real lives we are living right now. So this married man was turning these pages thinking, ‘I need this. I am helped by this!’ I think you too will be helped. Sam has written a thoughtful, pastoral and very helpful book. Sam has a wonderfully biblical understanding of singleness and great insight into the lived experience of single people, including the challenges and the benefits. Many of the folk in my church experience some frustration (and pain) in their singleness. This is a great biblical antidote to that frustration.